The Kailasanatha Temple at Ellora dates back to the period of the 8th century Rashtrakoota ruler Krishna I . It is a huge rock cut monolithic temple built in the South Indian style. Ajanta and Ellora, near Aurangabad are well known tourist attractions. 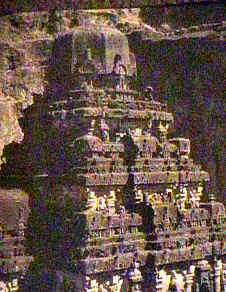 In Ellora, are also seen several Jaina, Buddhist caves. The Kailasanatha temple is known for its architectural grandeur as well as its sculptural splendour. History: More than 30 temples have been carved from the hillside here at Ellora during the period 6th-9th centuries CE. The most spectacular of these is the Kailasanatha temple, which is a colossal monolith with an ornate exterior, all carved out of the hillside. It was built during the period 757 and 773 CE. The Temple: The Kailasanatha temple exhibits typical Dravidian features. A gateway, an enclosure for Nandi, and a mandapam line up in front of the sanctum which is crowned with a vimanam, composed of successively receding storeys, decroated with miniature buildings. The mandapam in front of the sanctum is an enormous hypostyle hall with carved pillars. On either side of the Nandi Mandapam are two 50 feet high obelisk like pillars decorated with frieze carvings. A collonaded gallery running along the bottom of the cliff face, forms a deep narrow passage that surrounds the temple. In between this cliff face and the temple is the pradakshinapatha. The narrow passage mentioned above has two storeys of hypostyle halls and porticoed galleries (as in the Tiruchutru Maaligais of the Dravidian temples of Tamilnadu). The temple covers an area of over 60000 square feet, and the vimanam (tower) rises to a height of about 90 feet. It is to be emphasized over and over again, and seen to be believed that the entire monument was made by excavation and not by construction. The temple tower resembles the rathas at Mamallapuram near Chennai in Tamilnadu. The Kailasanatha temple resembles the architectural style established by the Pallavas of Mamallapuram and is yet considerably grander in scale. The shikhara (vimanam) displays a profusion of sculpted images. The shore temple at Mamallapuram was built around the same time as this temple. While the shore temple was built dressed stone, the Kailasanatha temple at Ellora was created by excavating 400 000 tonnes of rock, calling for sheer brilliance on the part of the visionaries who architected the temple plans. Architects from the southern Pallava kingdom were sought for the creation of this temple. Other caves of interest in Ellora are the Rameshwar cave, the Sita ki Nahani cave, and several Jain caves such as the Indra Sabha cave, all dating back to the pereiod 6th-9th centuries CE.